Home > Practice Jewel / Massage manEdger > Appointments and Scheduling > How to Confirm a Pending Appointment? "Once a patient requests an appointment from my website how do I manage it? You can make your appointment book available for patients to schedule appointments online at their convenience without having to call you to check your availability. Your online appointment book allows patients to select an available treatment time and submit a request by completing the appointment form and clicking on the Book Button. An email message to be sent to the patient acknowledging the appointment request. An email message to be sent to you alerting you to the fact that a new appointment request is waiting for confirmation. When a request is received, you will need to Sign In to the administration area of your site to manage the appointment. On the Desktop page you will notice that in the "Pending Appointment" area there is an appointment waiting for your attention. Click on the patient's name to view the details of the appointment request. In the resulting popup you will notice the "Pending details" in the left column of the page displays patient information that was received from your website. For existing patients: If the system has already correctly selected a pre-existing patient, you can simply hit next. If you believe you have a pre-existing patient in your database who has not been properly selected, use the “manual patient match” to search for the appropriate profile. You can search by name, first name only, last name only, or health number by clicking on the search icon to change your filter. 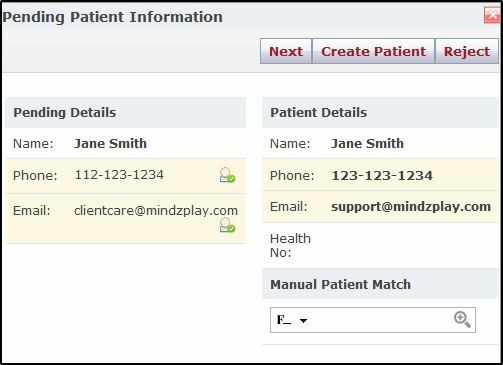 For new patients: If no patient matching the pending details exists in your database, you will need to create them a profile before booking. To do this, click the Create Patient button to create a profile. Note: If you see the copy icon beside the requester information for a pre-existing patient, this indicates the requester information is different than the pre-selected profile information. To update the profile, just click on the copy icon for each updated piece of information prior to booking the appointment. to confirm the appointment. This will remove the “pending” label and enter it as a regular appointment in your schedule. By default, a confirmation e-mail will be sent immediately to the patient, followed by a reminder one day prior to their scheduled treatment. Your online appointment booking is now complete.